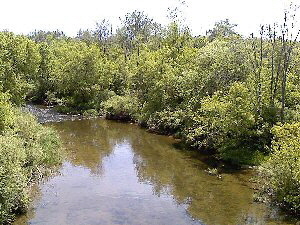 The Clinton River is a stream in the southeast of Michigan. The main branch of the river rises from wetlands in Springfield Township, Oakland County, northwest of Pontiac. A series of dams create a number of small lakes west of Pontiac, the last of which is Dawson's Millpond. The river is piped under downtown Pontiac, re-emerging on the city's near eastside. The north branch and the middle branch rise in northern Macomb County and join the main branch in Charter Township of Clinton, which was named after the river. The main branch flows 80 miles from its headwaters to Lake St. Clair in Harrison Township, Michigan.